Here you take a full box of regular Ritz crackers and toss them in 8 tablespoons (1 stick) of melted, unsalted butter. In a separate bowl, combine one package Ranch Seasoning mix, 1 tablespoon red pepper flakes, 1 teaspoon garlic powder and 1/2 cup grated Parmesan cheese – stirring to combine. 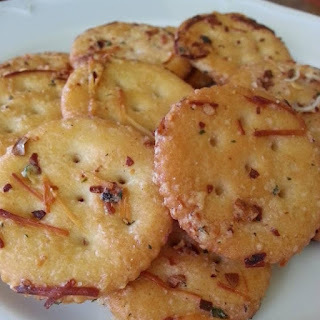 Shake over buttered crackers and gently stir to coat crackers in mixture. Place on a half sheet pan and bake in a 300°F oven for 20 minutes. Remove from oven and allow to cool completely. Enjoy!